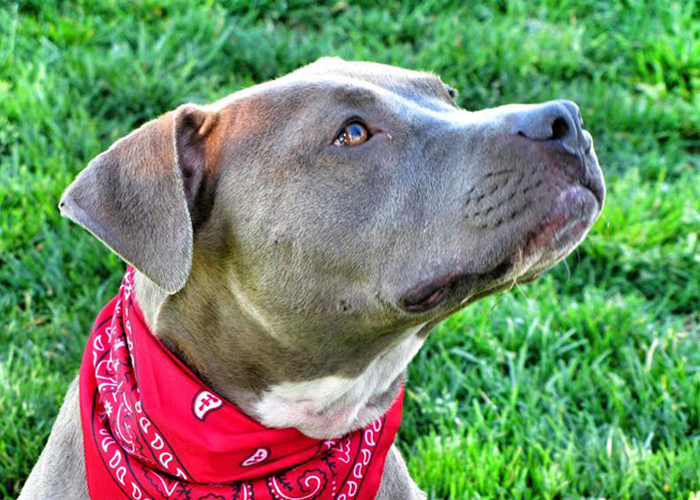 Founded in 2014, IPittytheBull has worked to “educate, advocate, and never discriminate.” Founder John Flores and his team are passionate about reversing the negative stereotypes surrounding pit bulls and other “bully” breeds. “Dog first, breed second” and “Human first, race second” are John’s rallying cries. The mission of iPittytheBull goes beyond dogs, which is why you will find John and his team working not only with animal rescues but also in schools and with the homeless. Meet Penny Lane. She is the inspiration behind iPittytheBull. After suffering multiple concussions, John Flores couldn’t drive, couldn’t work, and could barely keep his balance. John had been seeing a therapist and one day his therapist suggested he consider getting a dog. Believing he was much too busy for a dog, John resisted. But when his best friend showed him a picture of a six-month-old blue nose pitbull in need of a new home, he let down his guard and relented. John is convinced his therapist’s five words “John, you need a dog” changed his life. Meet Elvis. Elvis is the face of iPittytheBull and, according to John, the NICEST dog you’ll ever meet. John rescued Elvis hours before he was to be put down after seeing his face on a bulletin board while volunteering at a pet rescue. After conquering ringworm and kennel cough, Elvis finally got to meet Penny Lane, and a new adventure began. Their relationship taught John that, sometimes, the best dog trainer is another dog. John credits Penny and Elvis with helping him find his true passion, and now his “pack” includes a cranky pot-bellied pig named “Snack Pak,” a Thai “princess” who was rescued from the meat trade, and several other four-legged friends John now calls family. Since 2014, iPittytheBull has fostered and cared for more than 100 dogs. Now they are ready to do more! iPittytheBull is transforming their garage into an ultimate dog rescue. The goal: to rescue overlooked, adoptable dogs regardless of any negative labels. They are making great progress toward their goal, but they need our help! Please consider joining 4Knines in supporting iPittytheBull as they prepare a mini-sanctuary for future rescue dogs and prepare to save more lives! You can help by donating directly to the iPIttytheBully fundraiser or by purchasing an item from their wish list.